The entire seat back hinges forward and down onto the seat surface. Then the seat surface is pulled up then outward onto the floor. There is an internal glide and roller mechanism to assist this and its smooth as silk. Next the hinged seat-back pulls straight out and folds over also making contact with the floor. While all this is happening the integrated satin (or satin like material) bed liner opens up right along with each stage. Again, you really have to see this is person to appreciate how incredibly cool this is. Lastly, just add sheets and pillows etc. and you’re done! Not ONLY did I watch this exact couch on e bay but I was very close to having my mother in law who lives in LA go view it and possibly buy it for us. le sigh. What a gorgeous sofa. Anyone know how much it went for on ebay? I’m just curious. Well, beautiful pics of a beautiful sofa ! what does this beautiful sofa bed cost and where can I get one? Wow.. does anyone know who designed this beauty? Hi Tobias, is this still for sale? Wow! 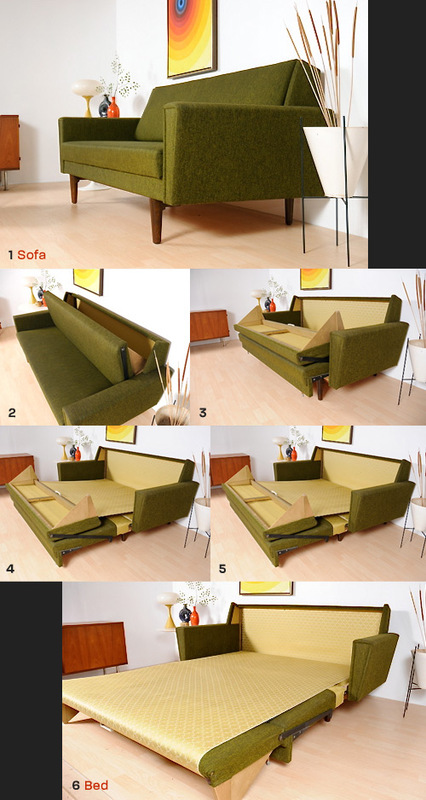 this sofa bed is beautiful! Does any company make this type of design today? It seems so advanced compared to what is out there. I would buy this vintage or new today if one existed. Why are today’s manufacturers so limited in their thinking?